Hurry over to get this PJ Masks Die Cast Playset for ONLY $9.97 (Retail $19.99)! 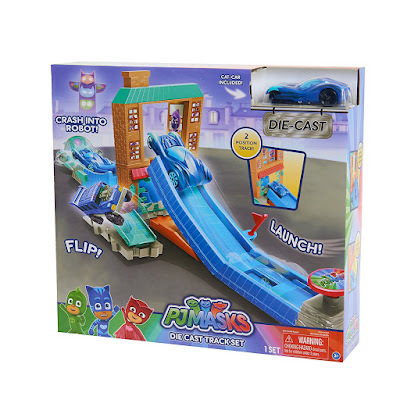 Gear up for action packed racing adventure with the PJ masks die-cast track set! this dynamic track set comes with one sleek die-cast cat-car and features tons of kid-powered features! launch the cat-car through the building and crash into Romeo's robot! pull the flag and adjust the track to send the cat-car soaring through the school's windows to stop the Ninja linos! place the cat-car on the side track to flip the car into action. So many ways to play! compatible with all PJ masks die-cast vehicles (sold separately). the full set includes: one track playset with adjustable launching ramp and one die-cast cat-car.